For the past couple of years a Goodreads friend, David, and I have had a running commentary on liberal and conservative views on issues at home and abroad. One of these issues concerned the rightness or fairness of Israeli settlements on disputed land, now called the Occupied Territories. The settlements have been pronounced illegal by the United Nations, but settlers continue to develop that seized land, claiming some religious right to it that legally they do not possess. This title just published by Harvard University Press describes how a disproportionately large number the original settlers in these disputed areas were in fact American Jews, middle-class, educated, left-leaning Democrats. This was startling information to me. Although my perception of the liberality or conservatism of America Jews has been shifting with the times, I never expected that essentially left-leaning liberals from the 1960s U.S. would become the symbol of what appears to be now essentially oppressive, entrenched right-wing privilege. Hirschhorn is clearly seeking answers to that very conundrum herself, and very carefully unpicks the origins of several settlements with an academic’s detailed forensics. What she finds is a kind of pioneering energy and fighting spirit, but also a kind of selective deafness and willful delusion. Each settlement came at a different time for a different reason, but those who chose to live on undeveloped “empty” land had their own impetus and intention, mixing up their defense of Judaism with a distinctly American notion of manifest destiny. 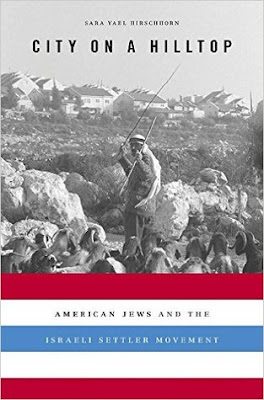 Citing a 1984 empirical study of American Israelis in Judea and Samaria by Chaim Waxman, Hirschhorn tells us that though many emigrating settlers in the 1960s considered themselves left liberals, the majority felt “Blacks in America have gone too far in their demands.” So maybe these individuals were not as liberal as they considered themselves, but under the surface were deeply conservative. The pioneering aspect of making settlements was so reminiscent of America’s founding that individuals felt some connection to debates about values that occurred at that time. It is worth noting that native Israelis felt American settlers were racist, even fascist. Hirschhorn highlights Sandy Susan at Kibbutz Kfar Etzion, and Miriam Levinger at Hebron to illustrate the intensity with which they struggled through the early days of deprivation and camaraderie. The Levingers were so sure they were entitled to the land “We see ourselves in a link in the chain of return…this site is biblical…we are sovereign…[in the Middle East] there’s no such thing as compromise.” Settlers often opposed the Oslo peace process which would return disputed territories to the Palestinians and as a result were often at the center of a cycle of violence. The Rabbi Shlomo Riskin of Brooklyn played an important role recruiting for a new camp at Efrat, which today is a high-middle class municipality composed of families whose adults often work in Jerusalem or Tel Aviv. Riskin had trouble finding a job in Israel, despite great success in growing his synagogue in New York, and when approached about establishing a new settlement in Israel, he did not hesitate. He believed the whole land of Israel belongs to the Jews, but that “It’s very important, very, very important” that the land be unclaimed. While in later interviews Riskin says the land of Efrat was “completely empty,” contention and resentment dogs the gated settlement which has seen terrible violence. The point is that thirty years ago there were dirt roads and pioneers who thought they were doing something difficult but worthwhile. Now the municipality is no longer temporary and is instead considered prosperous and even a little luxurious. It is normalized, and no longer something that one can be imagine giving up. Hirschhorn suggests Riskin paid lip service to “talking to everyone” and “every nation requires independence,” as he gradually crept rightward in his politics and religious teachings. In her conclusions, Hirschhorn suggests we can view American Jews in Israel within the larger category "Americans abroad:" liberal at home, illiberal abroad. The reality on the ground, they claim, changed them. So, here is that basic contradiction that Hirschhorn set out to unravel. “Rights” and “freedom” are two words that have different meanings depending on the context. Though Americans used to think those words applied to all within its borders, the camp settlers had narrowed that meaning to exclude Palestinians, just as today in America certain far-right groups believe their “rights” cannot be abridged but they are not so sure about the rights of brown-skinned citizens. “Americans…we just ran life in Tekoa,” a settler said of the settlement in the West Bank. “Living here reminds me of what America was like two hundred years ago. Here you have the spirit of just starting, of being a pioneer.” Except that one isn’t just starting. There is history to contend with, land rights, and Palestinians, who are growing increasingly agitated. Hirschhorn shows us what led individuals and groups to cross the Atlantic and shows us how, despite their claims to democracy, freedom, and fairness, they have exhibited something less than those ideals, sometimes far less. This is getting pretty confusing what exactly is an "eastern west bank"? Is it common theory in geography for a river bank to have a western west bank and and eastern wast bank? I imagine that the same would work on the east bank. So how would you define the location of Amman, the capital of the Hashamite kingdom of the east bank of the Jordan River. Would Amman be considered in the eastern east bank or in the western east bank? Also interesting to note that this study overlooked the British/American influence on the upbringing of the Saudi Hashimite settlers who control the east bank of the Jordan River. Examining that phenomenon might provide more perspective to the whole story. Thanks, David. I understand your confusion, especially since I noticed my spell-checker had auto-corrected one 'West' bank into 'East' bank. Eastern West Bank, however, is a term used by Hirschhorn to describe an area of land, which seems pretty self-explanatory to me, river or no. But I take your point. Re the Saudi Hashimites and influence from British/American interests, this does sound like an interesting addition to the discussion. Perhaps that can be your contribution? Thanks for your reply. I happen to live about 35 KM west of the Jordan River. Would my home be considered in the eastern west bank or in the western west bank? Thanks for your help. Let's recall that the first member of the Hashemite family, which rules Jordan, arrived in the country only in November 1920 (the family was finally thrown out of Saudi Arabia in 1924). That was Abdallah, brother of Faisal (portrayed by Peter O'Toole, if that helps) and great-grandfather of the current King, who sought to threaten the French to reinstate his brother on the throne in Damascus. The British didn't want any trouble with the French, who were to be the mandate rulers of Syria/Lebanon, and "gave" him the territory of Transjordan or Eastern Palestine. The term "West Bank" (meaning a region rather than its strict definition as the land above the edge of a river) was created in April 1950 when Abdallah, the illegal occupier of Judea and Samaria, annexed it to his Kingdom. A bit convoluted, perhaps, but there it is. What, then, is Sara's meaning of "eastern West Bank"? East of what? Of Highway 60, of the Allon Road? While I assisted her early research and was interviewed, and although I have not read the book (only parts of her doctoral thesis), from book reviews I am getting the sense that in no way can her findings be applied to all or maybe even a plurality of all the American immigrants who love in the post-1967 communities. As for the issue of liberal Americans, I think perhaps it would be clearer if I add an insight: for more liberal is not a political/ideological position but rather a civic culture within which we were raised. That culture, for example, to choose another area of our interest, is whether Jews should be permitted to pray on the Temple Mount. Note that American Jews are leading the Women of the Wall campaign which parallels that of the Temple Mount but they will not assist that issue because...it doesn't fit their politics. So, are they really being liberal? Thanks for your comment. The notion of land ownership in the Middle East is difficult, which is why it is a muddle there, perhaps. Folks did the best they could (lets assume all motivations were pure, as Hirschhorn does), but now we are seeing/feeling the grate of differing viewpoints & ideologies. Some adjustments must be made. Perhaps, as I have seen argued (by Israeli-American Tuvia Tenebom), there is "plenty of land" for everyone and there shouldn't be such strict prohibitions about settling it. Perhaps one day these questions will be the least of the concerns the region faces. But the fact remains that a group of people feel wronged, and to an observer untied to religious beliefs, there appears to be some merit in their point of view. Re Eastern West Bank, I take back what I said about it being self-evident. When I looked at the location Hirschhorn described, she description was not obvious to me, either. So I have removed that point from the discussion. Thanks for pointing it out. Regarding your point about the opinions of American immigrants to Israel, I suspect it is difficult to generalize. She primarily used three individuals in three camps to illustrate her larger point, though she may have used her other many interviews to formulate her final conclusions. She did point out that the people she quotes do not necessarily exemplify all the population in the camps today, but merely the spirit which settled them, and I gather, led them over the years. Your last point, about the civic culture within which American and Israeli Jews are raised, is raised briefly and tangentially by Hirschhorn. I suspect that civic culture is what Americans with no Jewish roots or ties imagine when they think of Israel. Liberal and conservative take on very different meanings once outside national borders, so I dare not wade into that though Hirschhorn did point out that early exit polls in the 2016 presidential election in the U.S. suggested 24 percent of American Jews voted for DJTrump. That just shows a change in values since 1967, a change we observe in both countries. David, I saw your comment late, after I had checked out a map and decided Eastern West Bank was not self-evident in Hirschhorn's use of it. Therefore I removed that reference from my comments. But, in answer to your question, in my opinion, if we were talking about Jewish settlements in the West Bank, you would live in Eastern West Bank. Just my opinion.